I love the Love with Food subscription service, I’ve loved the boxes they’ve sent me, and the fact that they donate a meal to a hungry child every time a box is purchased. In fact, I’ve fallen in love and purchased many of the brands featured in the Love with Food boxes- for example I recently bought a whole ten pack of those corn snacks they sent in their last box and I wrote about here. However, this months box – for me – was pretty disappointing. While the products weren’t terrible per se, they weren’t thrilling or interesting, and they certainly were not the yummy goodies that I associate with their monthly boxes. 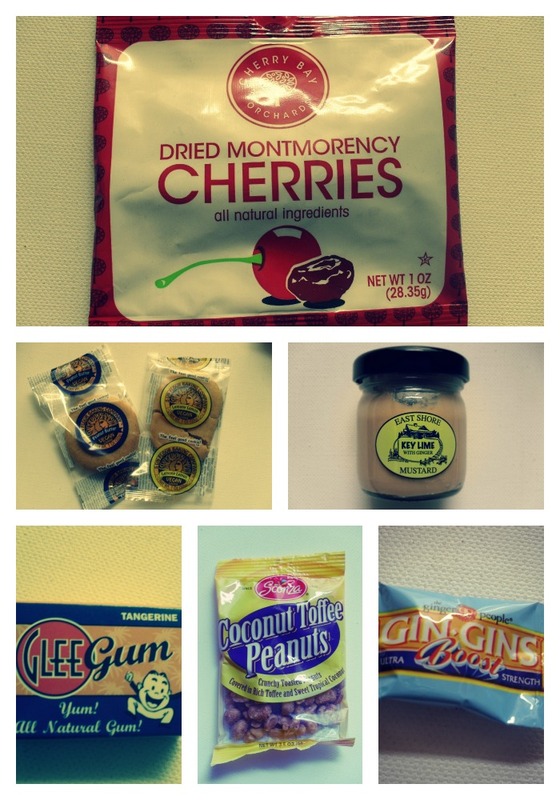 The product I was most excited about was dried cherries – and that for me is saying a lot. That being said, I want to make clear that some people will love this months box – but personally I feel the products, and selection were lack-luster. Skinny Dipping Pretzels by East Shore, Key Lime with Ginger Mustard by East Shore, Vegan Lemony Lemon, and the Vegan Peanut Butter Cookie by the Sun Flour Baking Company, Dried Montmerency Cherries by Cherry Bay Orchards, Coconut Toffee Peanuts by Sconza Candies, Gin Gins Super Strength Ginger Caramel Candy by The Ginger People, and Tangerine Glee Gum. The mustard was good, as were the pretzels. As I said, the products weren’t terrible – it’s just that speaking from a point of value – I can get a larger bag of pretzels at the bodega up the block for a dollar. The Glee gum is a product that is widely available, and the sample was tiny. The Coconut Toffee Peanuts just didn’t deliver for me – and again, I could get a similar product in my local bodega. The Vegan cookies weren’t amazing, and the two Gin Gins samples weren’t impressive either. The cherries were delicious, but I just don’t feel like the most impressive product in my Love with Food box should be dried cherries- a widely, easily acquired, not special product. Want to subscribe to Love With Food? Follow them on twitter, like them on facebook, and sign up for your own box HERE! Previous Post BlogHer ’12, Part 2! Next Post August Favorites – The Hit List! It was my first month to get a Love with Food box, so I thought it was pretty good. Now I look forward to getting next months box even more, since you say they are usually better. P.S. Feel free to look around at the reviews I wrote for their earlier boxes (which I loved). I’m with you. My first thought when I got this box was “Pretzels? Really?” Food is very much a matter of individual taste, but in this case it’s not about likes and dislikes. I actually really like pretzels, but most of us get these boxes in part to get something a little out of the ordinary, not something we’ve grown up on and can get at Walgreens. But, also like you, this won’t be my last box. I support their mission, and for $12 a month, if they can surprise me most of the time, this love will continue. I’m in my third gift month – items listed were left out of two month’s boxes, but no way to contact LWF. Their contact page does not work and if you cut and paste into an email, it just comes back. I’m terribly sorry that you’ve had a bad experience so far – try contacting them on their facebook page, I’m sure they’ll respond if you post on their page or tweet them! I’ve never had this problem before with them – good luck and let me know if they do/don’t get back to you!